If you’re planning to install a patio outside your home, you have probably been shopping around for what material to use. While each material has its benefits, we believe concrete encompasses the benefits of all the alternatives as well as offers more. 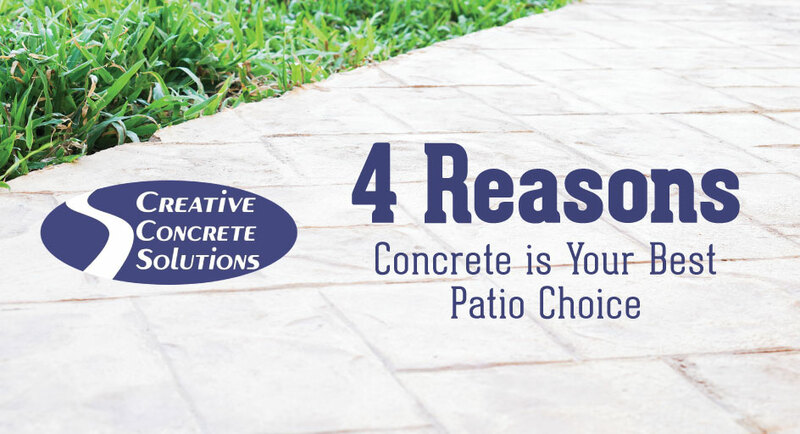 Since concrete has the capability of looking like any other material you might use for your patio, temporarily put looks aside as you consider these 4 reasons concrete is superior and the best option for your patio. Unlike most patio material options, concrete will last you at least 30 years if done right and taken care of with simple maintenance. Concrete can also stand up against most weather conditions such as the cold, rain, and snow. What would be your patio alternatives to concrete? The most common alternatives used are wood, pavers, or stone. Wood typically rots or splinters, stone is hard to clean, and pavers are always shifting and need readjusting. Patio materials like wood or stone have to look like just what they are: wood or stone. The benefit to concrete is that you can make it look like just about anything. That means your patio will never look like your neighbor’s patio unless you choose to have it that way. It can look like any material you want it to look like — tile, brick, stone, wood, or keep it looking like what it is, concrete. Whatever curve, pattern, stain, color, or shape you want, concrete can take on. Your patio will look unique to you and allow you a channel to express your style. That means you can choose to have your concrete patio stamped, engraved, stenciled, exposed, or stained. Concrete is unlike other patios in the fact it isn’t high maintenance. Wood needs to constantly be resealed and touched up, pavers have to be maintained to keep them in place and keep grass from growing up between them. Concrete only needs to be sealed once a year and cleaned up to keep it looking nice. And that’s only if you want to lengthen its life. While you don’t have to maintain your concrete patio, it’s recommended so you get the most time out of your investment. The best advantage of using concrete for your patio is cost. Concrete is much cheaper than wood, brick, or stone. Plus, it’s environmentally friendly. Concrete lets you get the look of an expensive material for the cost of a cheap one. What better reason do you need? If you’re worried what people will think, don’t be. the truth is, most people will be impressed you have such a durable, expensive patio. They don’t have to know it’s concrete unless you brag to them how it is. If you’re feeling doubtful, take a look at some of the patios we’ve done by clicking here. While they may look like a different material, they are all 100 percent concrete, easy to maintain, and durable.